To date it seems as though Ron Howard's unwieldy adaptation of The Dark Tower has as much forward momentum as Blaine The Mono sitting in the Cradle—a reference that people who haven't read the books may never get, because Howard's three Dark Tower movies and two limited-run TV series are probably never going to get made. Today's update offers a few changes to that story but, much like The Dark Tower series itself, no satisfying conclusion: Deadline reports that Warner Bros. is still considering whether it really wants to commit to the project it rescued from Universal's rejection pile, and its final decision (likely to be made within the next couple of weeks) now apparently hinges on whether Russell Crowe will sign on to star. 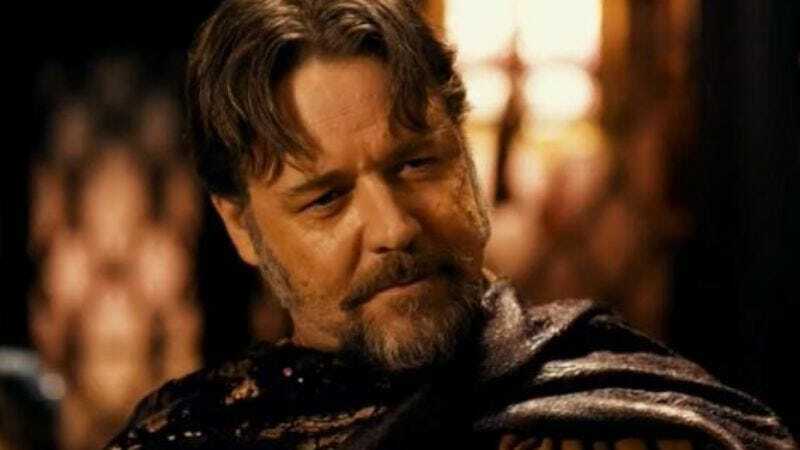 Crowe would be stepping in for Javier Bardem—who abandoned the role of gunslinger Roland Deschain after growing impatient with all the waiting around, just starring in James Bond movies and sleeping with Penelope Cruz to fill the hours—and already Howard, screenwriter Akiva Goldsman, and producer Brian Grazer are using their A Beautiful Mind connection to lean on him. Of course, Crowe's also got plenty to do already (starring in Noah, maybe directing a Bill Hicks biopic, trying to get this damn beehive off his paw and get to the sweet, sweet honey), and it would certainly be a tall order to ask him to commit to a part that could consume the next five years or so of his life, and all but define his career thereafter. Suffice it to say, it's not a great position to be in to have your stalled, hugely ambitious project hanging on a kind word from Russell Crowe, but maybe Howard will get lucky.